Raheleh “Minoosh” Zomorodinia is an Iranian-born educator and multimedia artist who employs photography, video, installations and performance to make visible for audiences her emotional and psychological reflections as seen in her mind’s eye and inspired by nature. Zomorodinia trusts and allows her creative process to reveal intuitive insights, giving form to unconscious knowledge of deeper mysterious truths. Her work exposes and experiments with humanity’s relationship to the natural world. 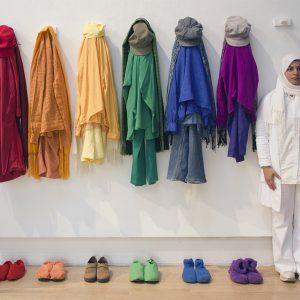 She is a member of the environmental artist group Open Five in Iran, and serves on the Board of WEAD (Women Eco Artists Dialog) in the bay area. She earned her MFA in new genres from San Francisco Art Institute in 2015, and holds a Masters degree in graphic design (2006) and BA in photography (1998) from Azad University in Tehran. She was awarded the MFA Fellowship at SFAI, the photography award from Pocono Arts Council and received Honorable Mention at the International Digital AVA Awards. Residencies awarded include: the Affiliate Artists Program at the Headlands Center for the Arts and Djerassi Resident Artists Program, and the ACRE residency in Chicago. Local and international exhibitions include: The Ocean After Nature at Yerba Buena Center for the Arts,Night Light at SOMArts, Living Spaces at Transylvania Art Center Romania, 4×40 Performances at Southern Exposure, Nietzsche Was A Man at Pori Art Museum, American Gun Show at WORKS San Jose, California Dreamin at Marin Community Foundation and The Altered Landscape at the Nevada Museum of Art.